Meticulously crafted in Esteli using a vibrant mix of 100% Nicaraguan tobaccos, the full-bodied Espinosa Habano cigar resides among the most respected and revered in the industry. Sporting a tough Nicaraguan Habano top-leaf over a lush mix of Nicaraguan binder and filler leaves, the Espinosa Habano is deeply complex in flavor with notes of caramel, tea, black pepper, roasted coffee, cocoa, citrus, and more. With multiple 90+ ratings firmly under its band, the Espinosa Habano has a proven track record in satisfying the most experienced of tastes. Master blender Erik Espinosa is far too humble to call it the “ultimate habano smoke,” but that might just be its most fitting title. Grab a batch now at the lowest prices anywhere and you be the judge. 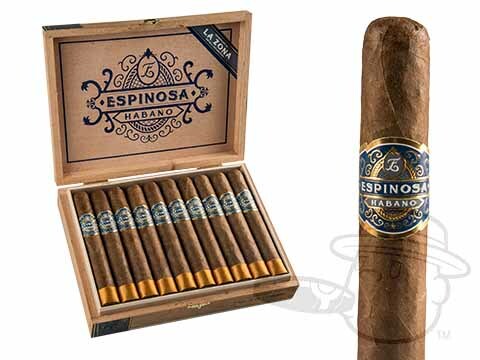 Espinosa Habano No. 4 is rated 5 out of 5 based on 1 customer ratings.